The punch I use to make the holes broke and I'm not sure when I will be getting a now one... as much as I would like to get this project done, it is pretty low on my list of important projects. ...but I should get a picture of what I have done so far. I haven't worked on this for a while for several reasons... as mentioned above, my metal punch broke. I also was not sure how I wanted to do the torso and other parts that need to be flexable. The stuff shown above will bend, but not quite enough to use for the entire torso. A thread I read today on the Chainmaille Board gave me an idea that should work. I am going to try combining the roman Lorica Plumata (scales attached to a backing of euro 4-1 maille) with a japanese 4 or 6-1 weave. The result should overlaping scales woven into a backing of japanese 4in1 or 6in1 (not sure yet what one I'll use). 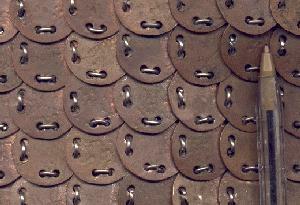 Some parts, depending on the degree of flexability needed (or not needed in this case), might have the horizontal rows of scales connected by rings, similar to how roman scale armor was sometimes made. I also now have a new metal punch, so I should be able to start working on this again. when last I left off, I had most of the shoulder doubling done. I still haven't done anything more with this yet, but I have not forgetten about it. I will likely be working on it again sometime in the coming year.